Riyad Mahrez's classy volley inspired Leicester to a comfortable 3-0 victory over Huddersfield. The winger lit up a turgid game before Islam Slimani scored his first Premier League goal since April last year and Marc Albrighton wrapped up the points. The biggest cheer of the afternoon was reserved for Adrien Silva as he made his delayed debut as an 86th-minute substitute in a match marred by captain Wes Morgan limping off injured before the half-hour mark. Portugal midfielder Silva was forced to sit out four months of the season when the Foxes missed the registration deadline by 14 seconds on his £22million move from Sporting Lisbon in August. Mahrez handed in a transfer request over the summer and, with the January transfer window open, reminded suitors of his talent. He and Algeria international team-mate Slimani netted inside seven second-half minutes as the Foxes ended a six-game wait for a win. Huddersfield have now won just two of their last 11 league games and offered little at the King Power Stadium on New Year's Day, but are six points above the drop zone. Leicester, who remain eighth, took their time but eventually made light of striker Jamie Vardy's absence with a groin injury, leaving him a doubt for Saturday's romantic return to former club Fleetwood in the FA Cup. Slimani made just his second league start of the season in his place. Silva's inclusion on the bench was the main talking point during a first half which lacked energy and chances. Harry Maguire tangled with Danny Williams on the edge of the area as the Terriers midfielder ran through, but referee Graham Scott waved away the visitors' protests. Leicester, with Maguire in particular, were sloppy and their defensive worries increased when they lost Morgan in the 28th minute. The centre-back injured himself while fouling Steve Mounie, for which he was booked, and he limped off to end his ever-present league record this season. 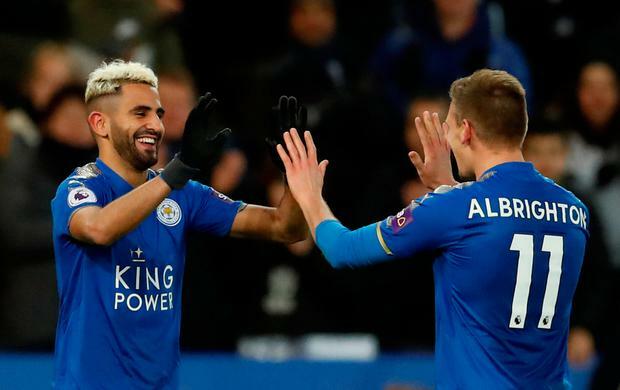 Wilfred Ndidi sliced well wide soon after but both sides failed to create any meaningful openings before Mahrez and Slimani lifted the gloom within 15 minutes of the restart. Slimani had already had a tame header saved by Jonas Lossl before, in the 53rd minute, Huddersfield only half-cleared a deep throw to Albrighton, who hooked the ball back into the area. It dropped for Mahrez at the far post and the Algeria international placed a brilliant cushioned volley across Lossl from eight yards. Seven minutes later Mahrez turned provider to send Slimani through and the striker kept his cool to chip in his third goal of the campaign. Leicester relaxed, with the game won, and almost added a third with eight minutes left when Ndidi's header hit the bar. Albrighton then did make it 3-0 when he converted from close range in stoppage time.